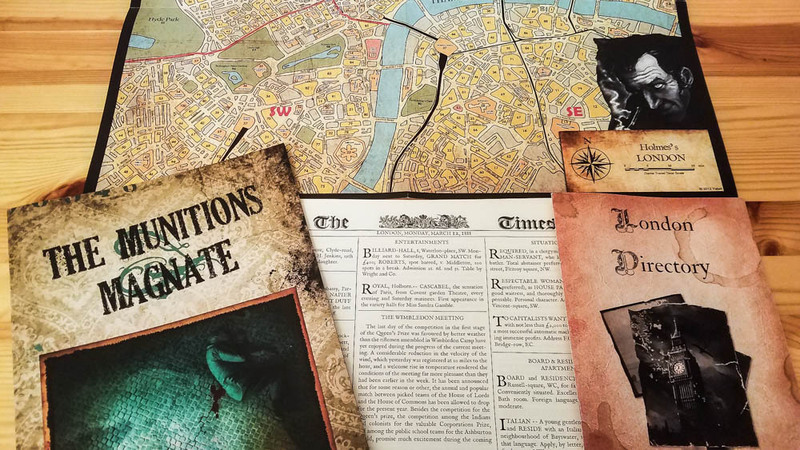 I was extremely excited to do this Sherlock Holmes Consulting Detective review, but it took some time to convince my group that it was a good idea to play a game that has you spend the majority of the time reading and listening. Well, I talked them into it, so read on to find out what we thought. 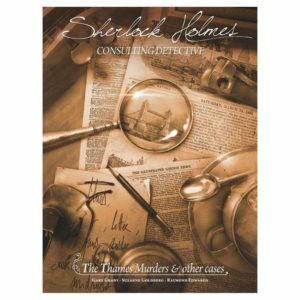 What is Sherlock Holmes Consulting Detective? In Sherlock Holmes Consulting Detective you and your friends try to solve one of the 10 cases included in the box. Sherlock will give you the details of each case, then you will use the case book, the London Directory, a map of London, and local newspapers to find all of the clues that you need to solve it. Each game of Sherlock Holmes Consulting Detective starts with someone reading the case details aloud. While one person is doing this, the other players should be taking notes so they can figure out which leads to pursue. After you’ve read through the case file, you will start trying to solve it. This means that you will need to read through the newspaper to find clues, and use the directory to find leads. On top of that, you can always look at the map to see if there is anything nearby that can help you solve the case. It’s up to you to decide where to go next. Even though anyone can choose which lead to follow next, it is recommended that you go around the table picking one lead at a time. You can also decide on leads to pursue as a group, then simply pass the case book around the table to let everyone have a chance to read. It really is up to your group. Once you and your team of detectives think that you have figured out the mystery, it is time to answer the questions at the back of the case book. You are hoping to score more points than Sherlock himself (good luck with that!) by answering all of the questions correctly and by using as few leads as possible. For us, it is more about solving the case than beating Sherlock’s score, but it’s always fun to read about how he went about solving each case. The theme in Sherlock Holmes Consulting Detective just pops out of everything included in the box. The cases feel like real Sherlock Holmes cases, the newspapers were brilliantly designed, and you really do feel like a detective when you’re looking around the map and through the directory for leads. The writing is fantastic. We’ve played through four of the cases so far and each one kept us on the edge of our seats. I could see all of them working well as TV episodes. I like that clues can pop up just about anywhere. This is really cool because often you’ll work hard as a group to come up with a direction you should go and usually you’ll find something useful wherever you end up going. This might sound weird, but it’s great that Sherlock is smarter than most people who play this game. Sherlock is smarter than most, so it makes sense that he knows which leads to chase and can usually crush your team’s score. My group also loves the “open world” feel of the game. You are on your own to figure out which leads to chase, which is great because it makes solving the case that much more rewarding. If you are going to be playing with five or more people, expect the game to drag a bit since more people will be chiming in. It is best when played with 2-4 players (or even solo), but we did actually have some pretty good games with six and seven people at the table. You have to do a lot of reading when playing this game. Sherlock Holmes Consulting Detective is pretty freakin’ amazing! It’s such a fulfilling feeling to solve the mysteries this game throws at you, and my group has even had a great time when we haven’t figured them out. I’m a huge fan of this game as is the rest of my group, but it’s not necessarily for everyone. For example, if you’re not into deduction games, then you might not be a fan of this one. But I still say give it a try since it’s unlike other deduction board games out there right now. This goes right near the top of my group’s top-rated cooperative board games list. It’s different than every other co-op game that we’ve played, and it’s one of those rare games that feels complete. It’s a must-have game for Sherlock Holmes’ fans… and just about everyone else. Update: All links now point to the newest version of the game. I’ve heard that the newest version fixes some of the minor issues some people had with the older versions. Thanks for taking the time to read our Sherlock Holmes Consulting Detective review! To stay updated on all things cooperative board games, follow us on Twitter, Facebook, or via RSS.